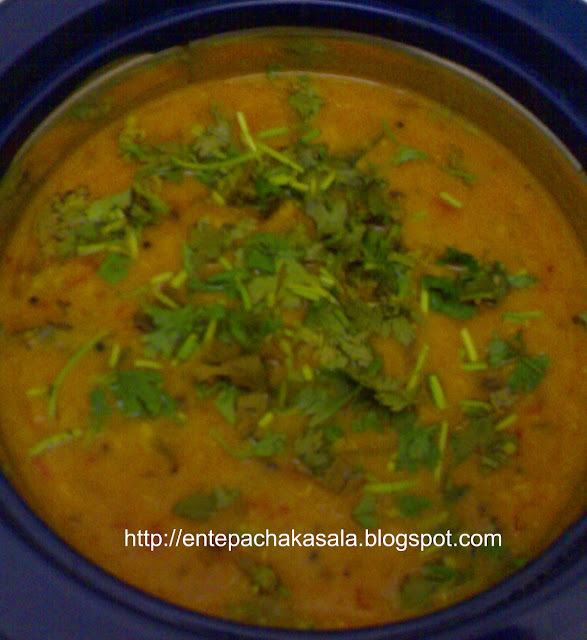 In a pressure cooker add dal, water, salt and turmeric powder, cook for 3-4 whistles or till turns soft. Heat oil in a pan splutter mustard seeds, cumin seeds and red chilli. Add chopped garlic and fry till golden color. Add onion and green chilli, fry until it turns translucent. Add the tomatoes and saute till oil starts separate. Add cooked dal and 1/2 cup water to this and simmer for 5-6 minutes. Remove from fire. Add chopped coriander. Serve hot with chappathi. Thanks for stopping by. I love dal fry with rice and ghee, Yummy !!! Looks good, perfect with rice, pappadam and pickle..
Dal fry looks really delicious. Looks too good..tempting love this with chapatis..
Thats a comforting dish, looks yummy..
hi thanks for visiting me . you have a great collection of recipes too. love this dal fry which is my most favourite recipe with rotis.